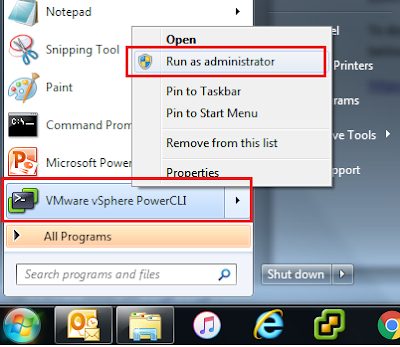 Techies Sphere: How to install VMware PowerCLI on Windows 7/10 computers? How to install VMware PowerCLI on Windows 7/10 computers? Or, Installing VMware vSphere PowerCLI 6.3 on Windows 7 / Windows 10. Or, Download VMware PowerCLI (VMware vSphere PowerCLI 6.3 Release). Descriptions: To install VMware vSphere PowerCLI 6.3 on your windows 7 computer, you need have Windows Management Framework 3.0 installed first. Windows Management Framework 3.0 is not required to be installed separately if you are already on Windows 10 OS platform. For Windows 7, you must install Windows Management Framework 3.0 before you proceed with PowerCLI 6.3 Installation. For Windows 10, you can directly proceed with downloading and installing VMware vSphere PowerCLI 6.3. Run the Setup and Install PowerCLI.